Washington Capitals right winger Tom Wilson could face a suspension of six or more games for a blindside hit to the head of St. Louis Blues center Oskar Sundqvist during a preseason game on Sunday. 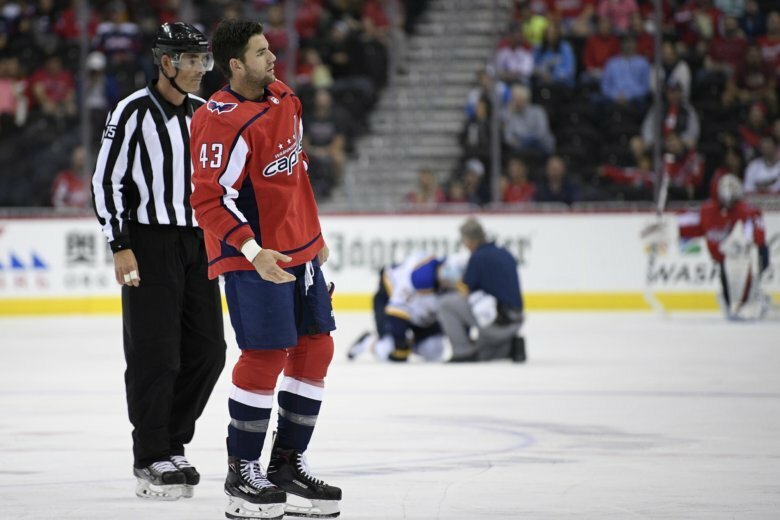 WASHINGTON (AP) — Washington Capitals right winger Tom Wilson could face a suspension of six or more games for a blindside hit to the head of St. Louis Blues center Oskar Sundqvist during a preseason game on Sunday. The NHL’s Department of Player Safety announced in a tweet Sunday night that it has offered Wilson an in-person hearing for the infraction, which earned him a 10-minute penalty during the game. That means the league is considering a suspension of six-plus games. “I’d be surprised if he didn’t miss a decent amount of time,” Yeo said of Sundqvist. Washington’s Tom Wilson has been offered an in-person hearing for an Illegal Check to the Head on St. Louis’ Oskar Sundqvist. Date and time TBD. The Capitals did not make Wilson available to reporters after the game. Wilson, who signed a six-year, $31 million contract in July to remain with Washington, has a history of throwing dangerous checks. He was suspended for three games during the Stanley Cup playoffs for a check to the head of Pittsburgh Penguins center Zach Aston-Reese that broke his jaw and caused a concussion.